Compost Sure comes in a 30 Litre bag. 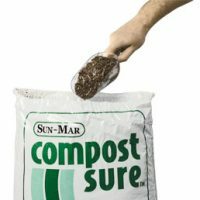 The composting additive consists of coarse peat moss and chopped hemp stalk. Hemp is the added advantage that Compost Sure has over homemade bulking material. Hemp will decompose where wood shavings and peat moss do not – giving your compost a longer residency time! More importantly, it saves you the time of making your own mix. To use: 1 cup per person per day (average), or 1 cup for every bowel movement. This accessory can be used with all Sun Mar composting toilets.